Juicy watermelon combines with garden herbs, bell peppers and cucumbers to create this summer soup that requires no cooking. Nutrition Highlights: The tiny leaves of so many herbs, including Italian parsley, basil and oregano, all used in this watermelon soup, are packed with natural phytonutrients and antioxidants. Watermelon itself is rich in two antioxidants, vitamins A and C, plus lycopene, a phytonutrient that may help reduce prostate cancer risk. If you love cold soups, don’t miss our Classic Tomato Gazpacho and Yellow Tomato Gazpacho recipes. In a large bowl, combine all ingredients and toss lightly. Puree half the mixture, in batches if necessary, in a large food processor or blender. Transfer to another large bowl. Stir the remaining diced mixture into the pureed mixture. Serve immediately at room temperature or chill 1 hour before serving. 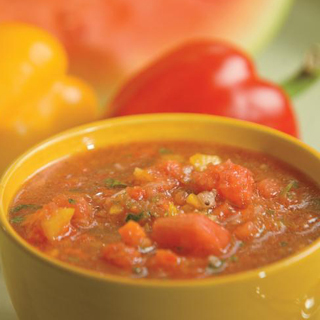 Refrigerate watermelon gazpacho in a tightly covered container. Nutrition Facts (per serving): Calories – 144, Fat – 4.3g, Dietary Fiber – 3.4g, Protein – 2.8g, Vitamin A – 63%, Vitamin C – 137%, Iron – 10%. If you’re really pressed for time, precut onion, bell pepper and watermelon are readily available in most supermarket produce departments. Linked up at Sunday Night Soup Night, Our Delightful Home, Made by You Monday, Cowgirl Up, Slightly Indulgent Tuesday. This sounds perfect for summer! Even though watermelon is sweet, I think it would go really well with the herbs and vegetables in this soup. Thanks for sharing this with Sunday Night Soup Night! Sunday Night Soup Night is taking a break over summer and will return in the Fall. In the meantime, I’m hosting a link up for all types of salads called Summer Sunday Salads! It starts this Sunday June 3. I hope to see you there! I have chosen this soup as one of my top 3 from Sunday Night Soup Night! I have tweeted it, pinned it and shared it on my Facebook page. It will be featured on Sunday Night Soup Night when it starts up again in the Fall. Thanks, Debbie! 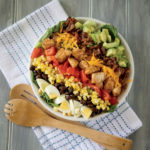 We’ll also be sure to participate in Summer Sunday Salads! Linked up at Whole Lifestyle Nutrition’s Whole Foods Wednesday, Beyond the Peel’s Whole Food Wednesdays, What’s Cooking Wednesday, Sugar & Spice.